Damp and water ingress are, at the same time, separate concerns that are interlinked. Whilst damp and its effects can be easily spotted and dealt with, water ingress represents a whole different problem. Both affect any motorhome. Essentially, any vehicle where holes have been cut in the bodywork etc can suffer from unwanted water getting in and wreaking damage – to soft furnishings and worse. Although most of the following applies to coachbuilt motorhomes, it’s not totally unusual for van conversions to suffer, for example from leaks at window or rooflight fittings. Simply, on any motorhome, wherever a hole is cut in the bodywork, there’s the potential for water to seep in and start causing real damage. Where water appears on the inside may not be the same place as it’s first entered the vehicle, of course. Water finds its own way, running along pipes and other channels, so where signs appear on the inside, it might be quite some distance from the slightest of cracks or unsealed screw holes where any water first gets in. 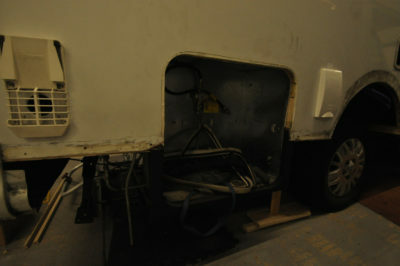 For coachbuilt motorhomes, it’s often the floors that are affected. A spongy feeling underfoot is usually the signal that you have a water ingress issue that’s going to need a serious assessment. Visual checks are a great start. It’s easy enough to assess the state of any rubber surrounds to windows and doorways, including hatches. The build-up of unwanted damp inside any motorhome can be a personal concern, too. Mould and mildew, in particular, can have a serious effect on your own health. Help is at hand. Regular checks of your vehicle by qualified professionals should alert you to any issues before they get out of hand. 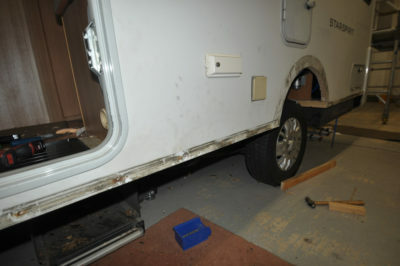 In the motorhome sense, water ingress is when fluid gets under the exterior skin of a coachbuilt body and goes on to attack the wooden framework and interior walling. It usually takes time to really get a hold – but it’s the framework that’s most vulnerable and, by the time you’re aware of anything untoward, it could be too late and you’re left facing a bill of thousands of pounds. That’s opposed to damp, which could just manifest itself as a result of poor ventilation and/or a build-up of condensation from inside the vehicle. 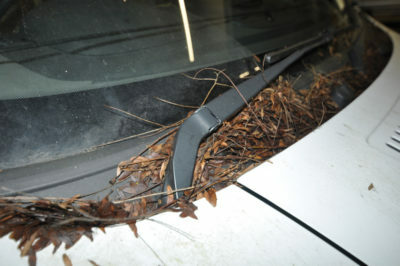 Water ingress can also occur because of ill-fitting windows or rooflights, as well as aftermarket accessories such as bike racks and ladders – anything where a hole is cut in the bodywork, even if it’s just to run an electrical lead inside. Arguably, wherever sealant has been applied, there’s the potential for water ingress. Over time, most sealants harden and lose their flexibility. Also, if you’ve had an accident and there has been damage to the bodywork, there is the potential for water to get in and cause more serious trouble. Once it takes a hold, water ingress can also affect the interior wallboarding as the effects of the dampness spread. Depending on the age and manufacturer of your particular vehicle, sourcing replacement wallboard designs is not always easy. Signs to look for range from staining – it could be black, blue or even pinkish – on the interior wallboard; or black along any of the awning enclosure rail (if fitted), or around windows in the coachbuilt body. Try to avoid bringing wet objects – from clothing to pets – into your vehicle. Similarly, if any liquids are spilt, mop them up straight away. Check for mould. You might see it, or smell it. Again, it could be a sign of more serious things. Regular cleaning of your motorhome’s interior will always help. It could even help you detect any early signs of trouble. 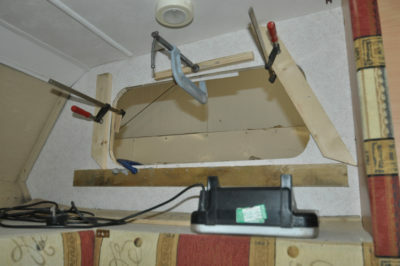 Although coachbuilt motorhomes have traditionally relied on a wood frame, more recently manufacturers have dabbled with different construction materials and techniques, including bonding and/or the use of plastic blocks in lieu of wood, to offset the effects of water ingress. If you’re lucky enough to have a new motorhome, it may well have a water ingress warranty. Its validity will, though, depend on regular checks as part of the routine servicing. You’ll need to check the small print. 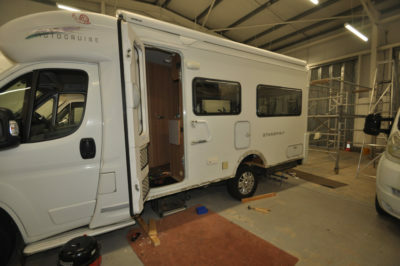 Also, a common misconception is, just because you do not use your motorhome much, there’s no need for regular servicing. Arguably, servicing is even more important for vehicles that simply sit unused for long periods. Have a good look around your vehicle. Rusting screwheads, loose trim, especially lower skirting and awning rails, and even just signs of damage to the bodywork are indicators of water ingress. Less typically, water ingress can occur from the inside out, for example via cracked shower trays or poorly fitted washroom items, including sealants. You could invest in your own damp meter. Although such items can be picked up for as little as £10, typically a professional unit, as used in a workshop, will cost from around £200 new. Any time is a good time to book a habitation check with your local dealer or mobile workshop. Their busiest times are typically in the run-up to Easter, but there’s no reason you can’t book in for a service at any point in the season. If you’re especially concerned about water ingress, book in for a one-off damp check. For an up-to-date list of workshops approved by trade body the NCC (National Caravan Council) go to www.approvedworkshops.co.uk. Dehumidifying crystals are an effective, low-cost way of minimising the build-up of damp in your motorhome. If it gets more serious, consider an electrical dehumidifier. Do not use a powerwash on your vehicle. Any concentrated spray of water can lift or damage sealant, if it’s already weakened. In worst-case scenarios, it can even dent aluminium skin. Keep on the right side of the workshop staff at your local dealer – the advice they can offer can be priceless. Above all else, it’s that annual habitation check that is critical. See also our guide to spotting damp inside your motorhome. Got any hints and tips you’d like to pass on to other Caravan Guard readers about how to control damp and water ingress? Please feel free to add a comment below. Has anyone got an article or information about how to seal joints with mastic? What to use and where to buy it? Hi Stephen, we’d recommend you use an NCC approved workshop or repairer. Hi, this is not about damp , but about my fire .it is a Bowen air system and hot water. When I put it away the camper that is it worked fine . But now nothing ,I have power to it but I can’t get it to light or anything. I have changed the battery at the bottom of the fire for the ignition but that makes no difference. It’s probably worth going to your dealership or contacting a mobile engineer to come and take a look. Although our van is only 3 years old, during the winter months, and when it not used during the rest of the year, I leave a mains operated dehumidifier in the van, and every so often leave it on for a day, its remarkable how much water collects in the drip tray, a quick empty and the unit is ready to operate again. I wish we had this advise to hand before, We were first time Motorhomers and unaware that this is a common problem in Motorhomes, we were aware that water ingress is common in caravans. I bought a new Autotrail Apache 700 SE in 2004 it has now only done 27000 miles, but has a full service history including two cambelt changes. It is in immaculate condition, being parked on the drive outside of the house it has a permanent hook-up which allows me to keep a trickle charger on. Last week it had a full habitation service and even with this TLC they found the cooker burner was slightly blocked and the flame burning yellow,(Which is now repaired) they carried out damp tests in 110 different places and left me with a plan of the 100% ok result. I now feel comfortable to start the new season confident I have done everything possible to avoid any problems. I would recommend this service to all motorhome and caravan users. Thanks Alan. Great advice and pleased to hear your motorhome has a clean bill of health for the season ahead. Hi Graham, you use the meter at different points around the caravan, along the walls and inside the lockers.